Like most kids who grew up when I did, I loved dinosaurs. When I was four, I could pronounce their names probably better than I could most common English words. I even thought I would be a paleontologist, following along in the footsteps of Marsh and Cope and Horner and Bakker. Well, obviously that didn't happen, or this blog might be called Fossil Feelings instead of Panel Patter, and I'd have a completely different subject and audience. However, I do get a bis nostalgic for those heady days when I was quite sure you'd find me with a little pick and dust brush, trying to discover a Robosaurus or something. In a way, my child-like enthusiasm is not far off from the passions we see in Bone Sharps. The difference is that these are men with all the corruption that goes along with being grown up, and their enthusiasm takes them down darker paths, as Marsh and Cope write screeds, plant fossils, and use what political power they can bring to bear to ensure the ruination of the other. In the hands of Ottaviani, the pair are like warring children or cartoon characters, with the only thing missing a big explosion or perhaps a comic chase scene across the Wyoming desert. If you know anything of the history of the post-Civil War years in America, you won't be very surprised to learn that just as in every other field at the time, there was vast speculation, booms and busts, and those attracted to the field weren't above using underhanded tactics to get their way. Marsh, from this account at least, was a bilker of the government and a horrible employer. Cole lived above his means, which eventually caught up to him. Others were gamblers or schemers in other ways, making the few honest people (such as Chief Red Cloud) look like saints. American history is not a pretty subject, and Ottaviani makes that clear. In terms of an informative narrative, I think this book works well. The story flows from beginning to end, and while it's clear that facts are shifted or changed a bit to make it work better than it should, I don't think that Ottaviani strays so far as to turn this into a work of fiction. Think of it like you would a really good biographical movie, and you'll have a solid feel for the material before you start reading. You'll come out of this one with a better understanding of how the Bone Wars were won, but don't plan on writing any scholarly papers from this book. Thanks to a nice reference section, however, it's easy to use this as a springboard to other works, if you are so inclined. Big Time Attic is a production house made up of three artists in this case, one of whom I know from other comics. [Edited with new info courtesy of Ben Towle. Thanks man!] If you are familiar with Zander Cannon's other work, you'll see his influence on most of the pages. They do a good job of making the comic feel like it's set in the late 19th Century, complete with the decision to use a sepia tone rather than black and white. The artists' depictions of historical figures is pretty good, as I could usually identify them without narrative help. I'm even going to give a shout out to the lettering, because P.T. Barnum speaks in circus poster font, which is absolutely brilliant. 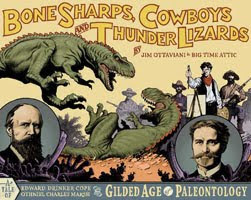 Bone Sharps is a nifty little book that peels back a layer of shine from the Age of Dinosaur Hunters. My only minor complaint is the absence of Andrew Carnegie, who also had a hand in this insanity and should have at least gotten a mention. That's a minor omission, however, and one most probably wouldn't even notice, despite the fact that he does have a dinosaur named for him. If there's still a little kid inside of you who wants the T-Rex to fight the Triceratops, find a copy of this book and let the adult side of you learn the dark underbelly of what left your childhood self speechless, time and time again. Not only will it not spoil the wonder, it might even rekindle it. Now where did I leave my dust brush...?